Ranil Wickremesinghe was born on 24th March 1949 with the proverbial silver spoon awkwardly stuck between his toothless gums which his father carefully extracted and thus freed the new born’s silver tongue for future use on the nation’s behalf; and which spoon was, thereafter, used by the family to dish out to him all the delicacies life had to offer. They did a pretty good job of it; and Ranil Wickremesinghe could have supped life to the full, enjoying all the comforts and riches privileged birth afforded. But he didn’t. Instead he chose to tramp the murky streets of politics where the spectator sport was to hurl rotten eggs and quashed tomatoes from the sidewalks to all who dared to take that road. Especially to rich upstarts on a public highway, willing to be exposed to the slings and arrows of mass outrage. Like Siddhartha who renounced his worldly kingdom and wealth to trod the path of his ancestors, the twenty seven Buddha’s before him, Ranil forsook a life of sloth and private indulgence; and, though diapered in a continent of great wealth and privilege which would have enabled him to remain cocooned in a world of endless pleasures and live the heady life of the lotus eater, took to the long and winding graveled road, as some of his illustrious forefathers had done before him, to answer the call of his genes and to discharge the inborn duty that beckoned to sacrifice his private idyll and sweat and tear and even become the target of scorn, ridicule and hate, to serve his fellow countrymen as best he could and to proffer them the leadership a civilised race with a recorded history of over 2000 years deserved. Unlike Siddhartha, however, he did not embark on his chosen road leaving a kingdom behind him but only to gain the political kingdom of Lanka and to hold court thereat as the lord of all he surveyed. Birth had given him a head start. His mother Nalini was the eldest daughter of Lanka’s first press baron D. R. Wijewardena who founded the Lake House Group of newspapers and was a key figure in the independence movement. Ranil’s father was Esmond Wicremesinghe; winner of the prestigious Golden Pen of Freedom awarded by the reputed International Press Institute and was a powerful member of the Working Committee of the United National Party from 1973 to 1985. He has been widely credited as being the brains behind the ‘Brains Trust’ of the UNP to bring down the Bandaranaike regime from power in 1977. “In 1976, I found myself with the UNP’s apex decision-makers of the time; the ‘Brains Trust’; the team that was plotting the return of the UNP to office. It was clearly Mr. Wickremesinghe who ran the meeting. My assignment was to do some research. All I recall JR saying was something profound like; “We must convert the un-convinced and convince the converts”. A man of few words, he seemed to sum it all up. Needless to say, the UNP won that by-election — Joseph Michael Perera going on to become a Cabinet Minister and Speaker of Parliament later in his political career. In a year’s time, the UNP was returned to the seat of Government — a landslide victory with a whopping 5/6th majority. 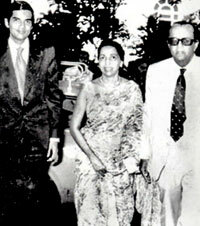 One of Ranil’s uncles was J. R. Jayewardene, the rising star at the time of Ranil’s birth, in the UNP firmament. He himself had patiently borne his time and waited till Dudley Senanayake’s demise in 1973 to take over the reins of the UNP. 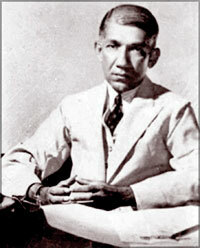 Thus in that summer of 1977 when Mrs. Bandaranaike finally decided to throw in the towel and give relief to the people’s ache for regime change, both his father Esmond – as the dynamic energy marshaled to create UNP resurrection from its seven year moribund state – and his uncle J. R. Jayewardene as the UNP’s prime ministerial candidate were positioned to herald Ranil’s advent to the political road. It almost seemed as if the planets had been propitiously aligned to pave with gold Ranil’s pathway to the heady heights of Lanka’s political Everest. Even as his birth had given him a head start to gain an honoured seat in J. R.’s UNP Camelot, his own perseverance and inherent intelligence had rewarded him with the educational armour necessary to lance down any accusation that he had gained the opportunity to pursue his quest to find Lanka’s political Holy Grail through nepotism. Having cut his teen teeth on the ‘Learn or Depart’ anvil of his Alma Mater Royal’s motto, he had progressed to be tattooed with the LLB of a law degree from the Colombo University and thereafter had been called to the Bar as an Attorney- at- Law of the Supreme Court. He had earned his credentials on the educational battlements and emerged triumphant as a knight of the homeland before adventuring to take his deserving place at the privileged round table where his uncle JR – who wherever he sat at that round table all hailed him as Arthur – held supreme sway with the five sixth majority the masses endowed him with on election day 1977. 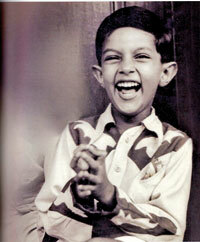 Ranil Wickremesinghe had just won his first election and was now a Member of Parliament. And his uncle JR was prime minister. What more could a young buck, with all the promise of a brilliant future before him, ask his household gods to render unto him? Merit amassed in previous lives had blessed him with a privileged birth. Perhaps the samsaric practice of service to his fellowmen had subconsciously driven him to repeat the habit. At the age of 28, he was called to pledge his life in the cause of his people. To uplift them from their myriad woes and offer them hope to transcend the perpetual nights of darkness and witness a new dawn breaking with the rise of a new sun. His uncle J. R. Jayewardene, billed the Twentieth Century Fox by his detractors, was a shrewd judge of character. Recognizing, perhaps, a star born, a new northern star to direct Lanka’s ship of state in the future, the wise wizard however did not rush to spoil the young political brat by adorning him with high political office. Instead he chose, in the manner of a self made father of a successful private business concern to put him through the ropes, to make the son first sweep the premises’ floor clean; and, depending on his willingness to obey – for one must first follow orders before one can issue them to others – and his competence in ridding the place of dust, to expose him to see the world as the Deputy Foreign Minister and then return from his Sinbad Travels with a luggage of experiences to set Lanka’s world aright. Once he had done his devilling at the foreign office and traversed the world and the seven seas, JR appointed Ranil as the Cabinet Minister of Youth Affairs. It was clear then that Ranil was being trained, brushed and groomed in the UNP stable to sit on the saddle when Uncle Dickie chose to dismount the rocking horse of political power. But the best laid plans of uncles and nephews can be disposed by unfolding events. And, perhaps the duo both realised it was premature to ride the UNP mare. And thus when Uncle JR ended his second year term and Premadasa rose from the grassroots to bag the UNP presidential nomination which JR endorsed, Ranil dutifully took a back step and remained in the wings, patiently waiting for his cue to be summoned to the stage. Even when the senior UNP stalwarts Gamini Dissanayake and Lalith Athulathmudalie rose in revolt and broke away from the UNP to form their breakaway group the DUNF and sought thereafter to impeach President Premadasa in 1992, Ranil Wicremesinghe to whom the Gamini – Lalith camp would have been natural terrain and liberal habitat, chose not to stray but to stay put and stay loyal to the tempered way of his then leader Ranasinghe Premadasa. It confirmed him as a team player, gifted with patience, one who will bide his time to reach his goal post when the moment was opportune and not stab his leader in the way Brutus plunged the knife into Caesar’s back. Heaven’s malice grants ambition’s prayers but unlike former President Premadasa who lost his life, unlike former President Chandrika who lost her right eye and nearly her life; and unlike like former President Rajapaksa who lost his throne and sceptre in his quest for a third term and earned instead the people’s opprobrium for reigning over a corrupt regime, Ranil Wickremesinghe, like his uncle Dickie, JR, did not pray at heaven’s gate for entry but patiently stood in line for his turn to gain entrance, in the belief that everything comes to he who patiently await. That did not mean he was a nitwit or that he was shorn of ambition. Nay, he also possessed shrewdness in good measure. Perhaps he thought that the exit of the party seniors Gamini and Lalith from the UNP to form their own party, left the field wide open for him to stake his claim to the party leadership once President Premadasa finished his term of office. Even if Premadasa was to be reelected for a second term, Ranil would still be 50 when the Presidential elections had to be held. If that was his thinking, events were to upset his calculations. Fates held otherwise. And offered him the presidency on a platter at the age of 44. But such was the calibre of the man that he was in no hurry to pick the crown that had tumbled down into a wayside gutter down Armour Street in Colombo 13 on that momentous May Day 1993 when President Premadasa was killed in a Tiger bomb blast. Ranil did pick it up. But ever the stickler to protocol, given to follow procedure to the letter and to place the nation’s welfare first before his own personal ambitions, and conditioned from birth to do the right thing, he did, indeed, pick it up. But not to place it upon his own head as he could easily have done as the undisputed heir to the UNP throne. Nay, he picked it up only to crown the then Prime Minister D. B. Wijetunge with the presidency, in the manner the constitution dictated and his own conscience commanded. When he held in the palm of his hand the near absolute power to anoint himself as Lanka’s new president, what did the man do? Like Siri Sangabo in the Jatakas, he cut his own neck and offered it to D. B. Wijetunge who did not even ask him for it. In that shining hour, Ranil proved his mettle and demonstrated that the strongest steel is that which had gone through the hottest furnace and emerged strengthened. And that was only for starters. He was to prove his selflessness a year later – now he was the prime minister for the first time – when the presidential election came around. The then UNP president Wijetunga had announced his intention to retire with grace from politics and Ranil was the chosen one to contest it as the UNP candidate. But when Gamini Dissanayake who had returned to the UNP fold and turned up at his door step and demanded that he be appointed instead, Ranil graciously surrendered in the interest of the party’s unity and placed the mantle of the UNP leadership on the fated head of Gamini Dissanayake. And when Gamini fell victim to an LTTE blast in the same manner both President Premadasa and Lalith had, Ranil acquiesced in the party’s decision to make Gamini’s widow Srima the UNP‘s presidential candidate. This decision, of course, may have been prompted by the realization that the mercurial charismatic Chandrika was an unstoppable force and that not even the best of men could compete on equal terms with her winning smile and charm. If Chandrika’s ivory was her fortune whenever she flashed her winsome smile with a twinkle in her eye, Ranil’s strength lay in his patience till the sun rose to dawn on his dwindling political hopes. In the year 2001 the sun did rise and shed its rays indeed on Ranil’s political fortunes for the world to glimpse his second coming as Prime Minister, but, alas, only to set three years later when Chandrika opted to dance the kaffringa with the JVP and leave Ranil in the lurch, stranded in the midst of the waltz. But her own two terms was up in 2005 and when she retired as President and the Rajapaksa orchestra started to play, it was clear – following the universal truism that no woman or man can ever forget their first love – that Ranil and Chandrika were destined to meet again. And their shaking a leg on the political dance floor had not been their last waltz. Their entwined fates to keep their tryst with their political destinies would happen again. But it would take another nine years. And the lady would take the first step to woo the hand of the man she had once spurned and dismissed with scorn and left power lorn. Enter the monk Sobitha. With his crusade to abolish the presidency. And Chandrika to sate her justified craving to turn the tables on the Rajapaksas for all the humiliations she had suffered under their regime. The mascot came in the form of Maithripala Sirisena. But the entire game plan, the play itself could not be staged without Hamlet. The prince who had long remained in the wings to answer destiny’s call had to be courted to make the supreme sacrifice. And Ranil Wickremesinghe, having made a realistic assessment of the situation, was ready and willing to forego the opportunity and forfeit his right to become the executive president. And, in an act of humility, agreed to play second fiddle for the nation’s good and offered the entire UNP voter base to topple the Rajapaksas from their pedestals and to usher in a Maithri era of just governance. Thus was it that on 9th January 2015, Ranil became Prime Minister for the third time. Even though the UNP’s representation in Parliament was dwarfed by the number of seats the UPFA held, the newly elected Sirisena felt duty bound to repose his belief that the man who had just crowned him king had the confidence of the majority of the House to be the new prime minister. In August, however, when the new general elections were held and the UNP garnered 109 seats – only five short of a commanding majority – Ranil became Prime Minister for the fourth time. Had he wished, he could have with some political horse dealing, gained the balance seats from all sides of the house. But he didn’t. Always the gentleman, he extended his continued support to President Maithripala Sirisena and agreed to serve as his prime minister till the inevitable day dawns when their paths must cross and the parting of their ways must be enacted in public. 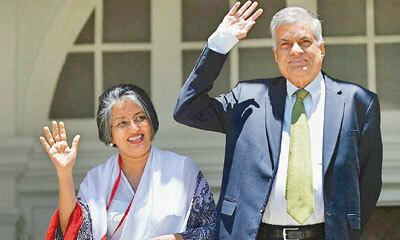 Ranil Wickremesinghe was blessed at birth as few men ever are. But thereafter, by his own efforts, he has achieved every goal he had set eyes on. Except the elusive presidency. Apart from popping out on the political stage intermittently as prime minister like a Jack in the Box at a Punch and Judy show to briefly entertain the audience or like an avatar of Vishnu in Hindu mythology to grant relief to a trouble stricken world, the ultimate crowning glory of the presidency has eluded him. That was something that lay in the hands of the Gods or etched in the fate line of his right palm. But if he didn’t take his pocket pen knife and slash his fortune line in the manner old Sinhala King Vattagamani Abhaya, better known as King Walagambha, did 2000 years ago when, on the run as a fugitive hiding in many a cave, he was told by an astrological monk that he will never be king since his palm did not have the necessary line to rule the land . The king pulled out his knife and cut his palm with the line and then asked the monk, ‘now do I have the line to be king? And maybe that it’s to the good of this nation that he has so far not become president. Had he become president in 1993 when the going was good and it was up for grabs and he held it in the palm and power of his hands, he would have finished his tenure by now and be condemned to the knackers’ yard to graze the grass with Chandrika. And even as the Prime Minister celebrated cutting his 40th political cake, holding the knife hand in hand with his present political stable mate President Sirisena, at least it must be to the nation’s relief to know that there are men of such character, such background, such breeding, possessed with such moral rectitude still left in Lanka to give the people leadership and bless them with the hope that from Ranil Wickremesinghe the best is yet to come. Perhaps the time has come for Ranil to use his knife of many uses not only to cut his birthday cake but to do a Walagambha with it. For he has many miles to go and many promises to keep before he can afford his sleep.